The Fiji Meteorological Services says they are closely monitoring the movement of Tropical Cyclone Mona which is now a category 2 system. The Met office says given that tropical cyclones have behaved erratically when encountering land masses in the past, the possibility of TC Mona making a landfall over Vanua Levu on Monday morning remains. The outer active rain bands from TC Mona have started affecting the northern and eastern parts of the country. The Weather office says as the system moves closer to Fiji, rain will become heavy and frequent. It further says the effects of strong winds are also expected from today which will increase to damaging gale force winds later tomorrow. Depending on the closeness of the system to pass land areas, gale force winds can be expected especially over the Yasawa and Mamanuca Group, Vanua Levu, Taveuni and nearby smaller islands. The effects of wind can cause damages to well-built framed homes which can blow away roofs, trees uprooted and branches being broken, severely damage weak structures, totally destroy shallow rooted crops, cause loose objects to fly, damage electricity lines and poles, damage water infrastructure, etc. TC Mona was upgraded into a category 2 tropical cyclone at 10am today. TC Mona remains to the northwest of the Group and has gradually picked up speed in the last 24 hours. The cyclone is expected to move towards the south-southwest until this evening, turn and then move east south east towards the Fiji Group from tonight. 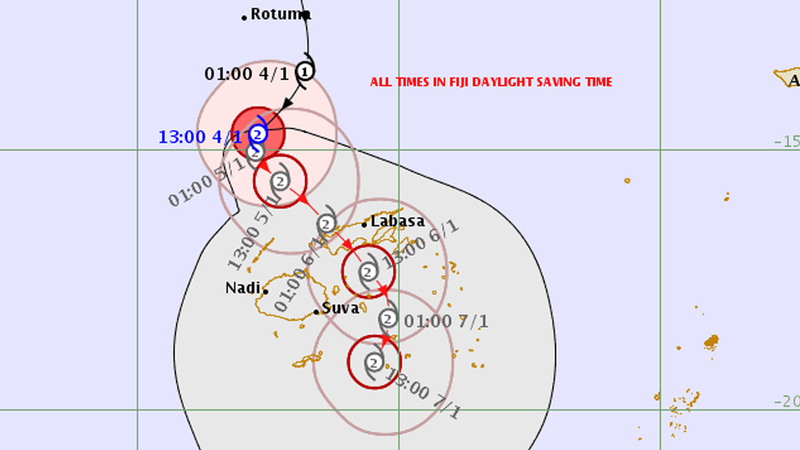 TC Mona centre was located about 230km north of Yasawa-i-Rara or about 300km northwest of Labasa at 10am. TC Mona is moving south-southwest at about 15km/hr. On the forecast track, the centre is expected to be located about 180km north-northwest of Yasawai-Rara or about 290km north-northwest of Nadi at 10 tonight and about 130km north of Yasawai-Rara or about 250km north of Nadi at 10 tomorrow morning. Meanwhile, an active trough of low pressure with associated cloud and rain lies slow moving just north of Vanua Levu and affects the northern part of the Group.